The heart of the Weld Mount System is our acrylic adhesives which have been specifically formulated to be used with our parts. They are high strength/high viscosity methacrylate’s with incredible strength in both tensile and in shear. We have a range of different adhesives depending upon your application requirements. Be sure and see our installation instructions for further technical details. 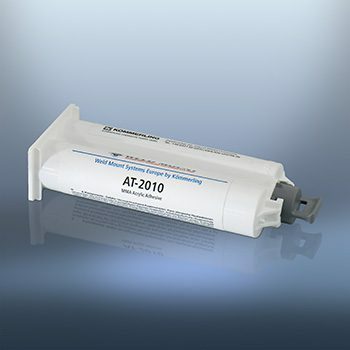 AT-2010 is our biggest seller and is a unique adhesive. It has high viscosity and will hold smaller parts without sagging. Heavier parts may need our AT-690 fixture dots to hold parts in place while the adhesive kicks. AT-2010 cures in 5 - 6 minutes, has a 4 minute working time and develops working strength in 15 - 20 minutes. This makes AT-2010 the ideal adhesive for applications which require an immediate high strength bond. AT-2010 has a 6 month shelf life when stored at 72 degrees. We recommend that where ever possible this adhesive be refrigerated. Packaged in a 50 ml cartridge and can be mixed by hand or by using our Köratool PM 207 dispensing gun and mixing tips. The 50 ml cartridge will bond 150 – 200 parts. For Brochures, Technical datasheets, MSDS etc. please visit the Media Centre. Weld Mount AT-8040 is a solvent free, VOC Compliant, two part methacrylate-based, structural adhesive formulated to bond metals for use in severe environments. It will also bond engineered thermo- and thermosetting plastics, composites to metals or various substrate combinations. It has excellent adhesion to as received metal surfaces including aluminum, stainless steel, galvanized steel, and plated steels. AT-8040 forms a tough, high strength bonds usually with minimal surface preparation developing handling strength in 12 minutes and a functional cure within 45 minutes. Ultimate strength exceeds 3500 psi of tensile shear strength on aluminum with remarkable impact and peel strengths. AT-8040 will hold all Weld Mount parts on a vertical or overhead surface without sagging when properly used.